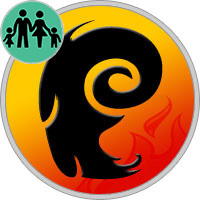 For Aries, children are an object of love and pride. He - just a wonderful parent, because it can easily win the heart of any kid or child older. He does not sneer with them, but communicates at the level of trust and understanding, trying to make friends. Mothers born under this sign appreciate the obedience of their children, so at times they can be unnecessarily strict. They should be more patient and loyal, learn to control their temper and anger. Parents show generosity towards their children, but they are not always able to show empathy and empathy. For example, the father becomes irritable when he hears of the problems that arise in the child: he wants to be proud of his son and daughter, and not participate in their consolation, considering it a manifestation of weakness. The position of the mother in matters of raising children is somewhat different from that of the father. She instilled in them from childhood free-thinking and the importance of a personal point of view, guided by progressive methods of education. Quite often a child inherits from his mother’s initiative and violent activity, which gives him the opportunity to have his own opinion on each issue, to form a personal taste. It’s great if the child can adequately assess any situation and make the right choice, not depending on the different opinions of the surrounding people. For children, Aries parents will be a wonderful example of courage and independence, the ability not to adapt to the opinion of the majority and existing conditions, but always choose the right path, even if it differs from the standard one. Parents completely pour out their love for children, preferring to praise them more often and hug-kiss. Despite the strict rules in the family, such mom and dad will open a fantasy world for the child and show a lot of prospects, teach to achieve the goal, always be able to protect the offended kid, help to choose the direction for future professional activity. Aries mom acts as a defender of her child, loves, and be proud of him. In the upbringing of her child, Aries mother is very enterprising. She perfectly perceives and feels the state of her child in any situation. Therefore, it helps your child to adapt in kindergarten, school and even the institute. Excessive care of Aries mother can play a cruel joke on her child, especially when he grows up and needs to become an independent person. In this case, it will be difficult for him to leave his parents’ home for an independent life, he can stay in the shower for a long time and spend a lot of time searching for his own way. As a father, Aries serves his child as an example of independence, responsibility, maturity, ambition and courage. Because of their self-confidence, Aries thinks that they can easily cope with the role of the father. But they forget that in order for them to achieve something, it is necessary to obtain the appropriate knowledge. Aries dad can easily criticize his child, to show rigidity to him, to limit his rules and attitudes. At the same time, he forgets about the precaution in dealing with a small fragile person, the peculiarities of his child and that he is not the only one who brings him up. He needs to review his actions, admit his mistakes and coordinate his decisions with the mother of the child.